What is your new bookRed, White, and Drunk All Overabout? I take my readers behind the scenes of the international wine world, exploring its history , visiting its most evocative places and meeting its most charismatic personalities. For example, while tasting sensuous pinot noir in the ancient cellars of Burgundy , I discover the mysterious tenets of biodynamic viticulture from the tiny, ferocious Lalou Bize-Leroy, part-owner of France's acclaimed Domaine de la Romanée-Conti. I work in a couple of wine stores to figure out how people can find the right bottle when faced with thousands of them. And I wade into a famous feud between Robert Parker and Jancis Robinson, two of the world's best-known wine critics to determine what those scores out of 100 really mean. The paperback edition of the book has just been published and includes a new chapter on five foods that are toughest on wine. What's your book not about then? How is your book different from other wine books? A lot of wine books are either encyclopedias or how-to guides. Those are certainly helpful in their own right, but that's not what I wanted to do. I prefer to tell stories about winetales that I hope will both entertain my readers and also teach them a lot. My stories cover all the aspects from grape to glass: how wine is made, marketed, matched with food, consumed and cellared. What's your approach in the book? I decided it would be best to roll up my sleeves and participate, rather than just observe from a distance. Instead of outlining the chemistry of fermentation science, for example, which might interest three or maybe four people, I worked with a marvelous and nutty winemaker in California , Randall Grahm of Bonny Doon Vineyards, during the harvest. I describe what it's like to be out in the middle of the vines, picking grapes under a blistering hot sun. Then back at the winery, I became one with my subject; essentially, a human grape: sticky, purple and completely crushed. Another time, to appreciate what good wine service is in a restaurant, I worked as an undercover sommelier for a night in the fivestar French establishment. That mainly involved dripping very expensive red white on white linen tablecloths and guessingwith convictionat wine matches for haute cuisine. I felt this would make for far more interesting reading than just listing twenty things you need to remember when choosing from a wine list. Wine books are usually organized according to region or grape, such as The Wines of Italy or A History of Zinfandel. How is your book organized? After considering various organizing principles, I finally decided on following wine's journey from grape to glass, from start to finish. So first I looked at how vines are grown before I examined the harvest; traditional wine regions such as France, before newer ones, like California; and still table wine before bubbly. I moved on to examining how we buy wine, serve it and match it with food at home�and then applied that learning to a restaurant setting. Finally, I reflect on the nostalgia of wine: we cellar it, remember it years after we drink it and respond to it emotionally. Apart from this, my narrative line also consists of my own reactions and observations. The book is written memoirstyle: as I move from one adventure to the next, my readers are always beside me�experiencing the people and the places as I do and knowing exactly how I feel about them. What other books has Red, White, and Drunk All Over been compared to? Those who've read it have compared it to several other books. One person described my book as A Year in Provence meets Kitchen Confidential and then goes Sideways. The book is also ideal for those who are part of a wine club, since it can give them new ideas for tasting themes and discussions. It's also good for members of book clubs who would enjoy a good glass of wine as they discuss this book and their favorite wines or most memorable bottles. In fact, I've included tips on how to set up an informal wine tasting with friends at home. My book will also be useful to those thinking of traveling to a wine region: they could either read it before going or while there. That's especially true for anyone visiting one of the famed wine regions I describe, such as California, Burgundy or Champagne. Those who prefer to be armchair tourists, with a good glass in hand, can journey vicariously with me. And finally, I think my book would make a great hostess gift for a dinner party or holiday gathering. Instead of agonizing over which bottle to bring when your host has probably already chosen the wines anyway, why not bring this book? It's a great conversation piece that will make you look cultured but with a great sense of humor. Although I've been exploring my passion for wine in the articles I write for magazines and newspapers, I knew that writing a book would allow me to dig even deeper, meet more fascinating people, travel to more interesting places and even spend more time thinking about just what makes us so crazy about wine. What is the most memorable wine you tasted for the book? In chapter one, I describe tasting the 2004 Grands Echézeaux from the barrel at Domaine RomanéeConti with winemaker Aubert de Villaine. At first, the gentle scent of rose petals fluttered up from the glass. Then it changed into a mixture of earth, leather and spicethe aroma of indulgence. I dissolved with pleasure into the wine, like a sugar cube with warm water poured over it. Where did you travel for the book? I traveled to France to explore two of it most coveted regions, Burgundy and Champagne ; and then I went to California to visit two of the fastest growing regions, Sonoma and Santa Cruz. Other chapters also involved travel, though not to wine regions. I worked in wine shops in San Francisco and New York ; hosted a wine tasting and dinner party in Ottawa ; and worked as a sommelier in Quebec. Which wineries did you visit? Although I visited many wineries for all my research, those mentioned in the book include Domaine Romanée-Conti, Domaine Leroy, Domaine Leflaive, Maison Joseph Drouhin, Bonny Doon Vineyards, Seghesio Family Vineyards, Veuve Clicquot, Maison Cazals, Louis Roederer, Bollinger and Pommery. What personalities from the international wine world feature in your book? The larger-than-life characters I had the privilege of talking to include Aubert de Villaine, Lalou Bize-Leroy, Anne-Claude Leflaive, Frédéric Drouhin, Randall Grahm, Camille and Pete Seghesio, Frédéric Panaïotis, Delphine Cazals, Martine Lorson, Christian Dennis, Gérard Liger-Belair, Marianne Barbier, Thierry Gasco, Jancis Robinson, Robert Parker, Kermit Lynch, Chuck Hayward, Ellisa Cooper, Georg Riedel, Danielle Dupont and Jay McInerney. Why do you have different covers for the American, Canadian, British and other editions of the book? Books are often published with different covers in each country. The publishers decide what cover art and strategy will best appeal to their readers based on previous experience, the competition, what aspects of the book they're trying to emphasize and other factors. What will readers learn about the practical aspects of wine? By the time readers finish my book, they will have gleaned knowledge about most of the important aspects. These include the way vines are grown; the importance of soil and climate; the influences of the winemaker's craft; the advances made possible by new technology; the process of harvesting grapes; the differences between various types of wine (such as still and sparkling, or Old World and New World); the international business of marketing and selling wine; the issues of copyright and authenticity; and the power that wine critics wield over wine styles and prices. Other issues I cover in the book include why the Australians and the Champenois have been such successful marketers; why wine is perceived so differently from all other drinks; how to choose the best glassware for wine; how to taste and analyze wines; how to match wine with food during a multi-course dinner; how to decant and serve wine; how to choose wine from a restaurant list and recognize great wine service; how to age and cellar wine; and what makes a wine truly memorable. What do you suggest for those who want to learn more about wine after reading your book? 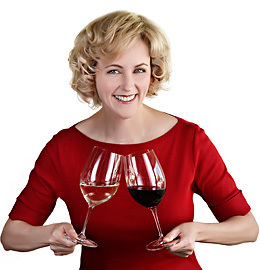 Taste as many wines as you can, take a wine course if you have the time and join my free e-newsletter at www.nataliemaclean.com. Every two weeks, I e-mail about 50,000 wine lovers my top wine picks, tips on matching wine with food, choosing from restaurant lists and cellaring wine. On my web site, I've also posted more than a thousand links to vintage charts, wine accessories, food-matching advice, wine region tour guides, producers and retailers, clubs and courses, industry jobs, and my favorite wine books and movies. The journey continues. Join me. What is the new chapter in the paperback about? Although I addressed general food-and-wine matching principles in the hard cover edition, I decided to focus on five foods that are toughest on wine: salads and vegetables, spicy dishes, take-out and frozen food, cheese, and chocolate. Why did you focus on this area? So many readers have asked me about these particular pairing challenges that I thought it deserved its own chapter. As a determined hedonist, I won't admit that there's any food that can't be paired with some wine. How do you approach pairing these foods with wine? The guidelines for pairing wine with difficult food are the same as those for traditional wine-friendly dishes: harmonize your flavor, texture, and weight. Beyond these principles, there are some specific tips to keep in mind with each type of food that I address in depth in the book. I've included a few general guidelines here, but you'll find the real meat of the discussion in the book. What should you keep in mind when pairing wine with salads and vegetables? My theory is that green food and green wine go together. So veggies dance with wines that have herbal, grassy aromas, such as New Zealand sauvignon blanc. In fact, if there were an award for Veggie Wine of the Century, it would go to this one. Not only does it have complementary aromas of asparagus and canned peas, but it also has bright citrus notes that complement most vegetables. How about pairing wine with spicy dishes? The flavors that survive heat are sweet and sour. That's why both crisp and slightly sweet wines can cool the palate after a fiery onslaught. Look for rieslings from cool climate regions, such as Germany, Canada, and Alsace where the wine preserves its refreshing acidity. These wines are the equivalent of diving into the ocean after getting a sun burn: invigorating and soothing. What would you drink with take-out favorites, like fried foods? Something dry�when you dig into deep-fried food such as fish and chips or fried chicken, you perceive the taste of fat as sweet, so you don't need more sugar in your wine. I love bubbly, whether it's champagne or sparkling wine from another region with fried food. It's the perfect contrasting complement in taste and texture. Nothing goes with �Extra Crispy� style of Kentucky Fried Chicken like a swarm of bubbles. Hard cheeses, such as gruy�re, cheddar, beaufort, and parmigiano become not just stronger as they age but also more balanced in terms of their flavors, salt, and acidity. Their flavors even mimic some of those in mature, full-bodied reds, such as notes of earth, nuts, and coffee. In fact, the harder the cheese, the more tannic the wine can be. Bordeaux, for instance, is the classic match for British-born cheddar. Is it possible to pair wine with chocolate? Absolutely! My favorite match for chocolate is port. Vintage port pairs well enough, with its plumy, grapey notes, but young ruby port is better with its aromas of blackberries and raspberries. Best of all is tawny port, since its aromas have a natural affinity with chocolate: caramel, coffee, nuts, dried figs, cinnamon, vanilla, and spice. With so many food-and-wine combinations, do you have any other tips? You really can drink wine with just about anything. Zinfandel with your Tex-Mex? Not a problem. A little chardonnay with your fried chicken take-out? Delicious. Pinot noir and wild boar? Why not! The old rules about white wine with white meat and red wine with red meat just don't give enough guidance anymore. With modern fusion cuisine and wines from new regions around the world, the choices�and confusion�are great. The point is to experiment and have fun. Your web site now features a free, interactive food-and-wine matcher: how does it work? The rationale to understand how to pair wine and food is in the book. However, there are thousands of potential combinations, so my free, interactive matching tool (www.nataliemaclean.com/matcher) complements that narrative by pairing wines with everyday meals, as well as challenging fare, such as vegetarian cuisine, egg-based sauces, cheese, TV dinners, and even dessert, including Jell-O and fudge (for those who like to layer their vices). Visitors simply search by wine for meal inspirations or by food to find great wine choices. There are more than 360,000 food and wine combinations in the matcher as well as thousands of recipes for a variety of dishes. I add more wines and foods based on readers' suggestions, which I gets from the 80,000 subscribers to my free e-newsletter, Nat Decants. The newsletter offers tips on how to buy, cellar and serve wine. If you've got a dish or a wine that's not in the matcher, e-mail me via my site and I'll find a match for you! Note: You can find high-resolution and web-friendly images of the book and matcher here: http://www.nataliemaclean.com/book/highres.asp.